How much is Markus Näslund Worth? 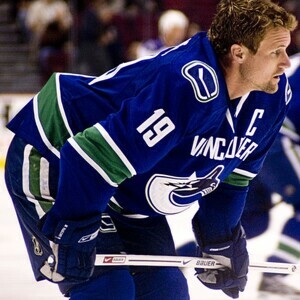 Markus Naslund Net Worth: Markus Naslund is a retired Swedish professional ice hockey player who has a net worth of $38 million. Born in 1973 in Ornskoldsvik, Sweden, Markus Naslund is a six-foot, 191-pound left winger whose professional hockey career began overseas before the Pittsburgh Penguins selected him with the 16th overall pick during the 1991 NHL Entry Draft. Naslund was soon dealt to the Vancouver Canucks, where he played for more than a decade. Naslund captained the Canucks for eight seasons and earned the team's MVP award five times. He led the Canucks in points scored for seven straight years. In 2008, he landed a free agent deal with the New York Rangers. He played on the East Coast for one year before retiring after 15 seasons in the NHL. He was a three-time NHL All-Star between 2002 and 2004 and won the Lester B. Pearson Award in 2003. Naslund's jersey was eventually retired by the Canucks in a 2010 ceremony, making him just the third player in franchise history to have his number hung up. Naslund played on the Swedish national team, including one appearance in the Olympics. He has won several medals during World Championship contests, including silver. He is a member of the Swedish Hockey Hall of Fame. Naslund has three children with his wife, Lotta. He is heavily involved in several charities, including Icebreakers, which is dedicated to raising money for children with medical issues Naslund's his native country.